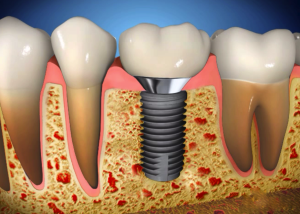 A dental implant is a long-term solution to tooth loss resulting from gum or bone disease, decay or dental trauma. The implant is a small titanium screw that is affixed to the jaw, which is then topped with a crown to resemble a natural tooth. In some cases, however, there is not enough bone left in the jaw to provide stability to the implant. In these cases, a bone graft is the best treatment option to complement the implant. A bone graft is usually a simple procedure and allows the doctor to fuse additional bone to the jaw, and adds strength to the implant site. Depending on the treatment plan, the bone graft may be completed at the same time as the tooth is extracted or during the placement of the implant itself. In some cases, the graft may need to be completed in advance to allow for healing time. Having a bone graft can help ensure that your implant procedure is successful and lasts for years to come. Your doctor will assess your needs and discuss your best options with you.